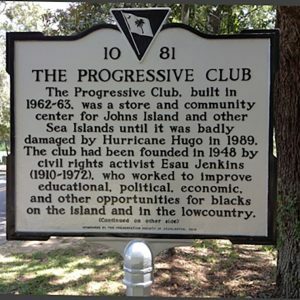 The Progressive Club Sea Island Center is significant for its association with events and people important in the Civil Rights Movement, beginning with the building’s construction in 1963 until the death of the Club’s founder Esau Jenkins in 1972. It served as a vital community center for legal and financial assistance, adult education, dormitory lodging, childcare services, recreational programming and even groceries. The building is the only remaining structure of the era in South Carolina built to house a “Citizenship School” where adult education classes and workshops enabled African Americans to register to vote, vote, and learn political processes.